View of Acropolis from Lycabettus Hill. The big building is the Parthenon, a temple dedicated to the maiden goddess Athena, whom the people of Athens considered their patron. Its construction began in 447 BC when the Athenian Empire was at the height of its power. It was completed in 438 BC. 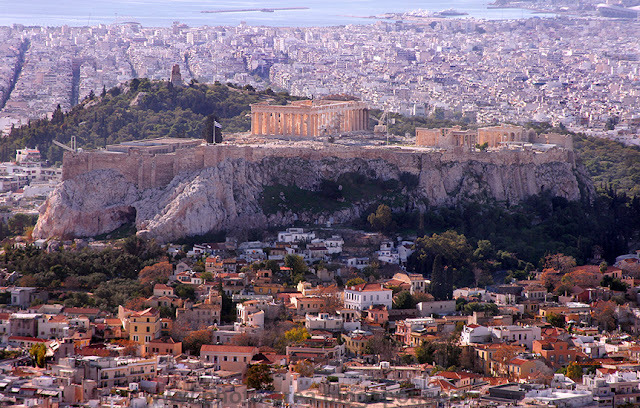 The view from Lycabettus Hill is stunning and should not be missed if you ever go to Athens. From up here you have a clear view of all the city in all directions. You can even see Piraeus port and the Mediterranean sea.